12 search results for "hotel vegan"
The Black Angels were technically a late addition at the Friday day show at Hotel Vegan. 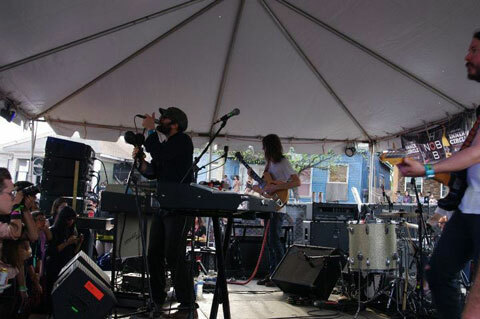 The band roster wasn’t announced until SXSW had already begun, but given that the band called Austin home, it was a welcome addition but not really a surprise. That being said, any opportunity to experience one of the premiere psych-rock bands around today on their home turf is a must see. The Black Angels have not released a new album since 2010’s superb Phosphene Dream, but the addition of two brand new songs to the setlist helped make this show special. We are streaming the opening track from Phosphene, “Bad Vibrations”, an outstanding version heavy in the reverb, sixties-style organ and haunting guitar lines. I recorded this set with the Sennheiser microphones mounted at the soundboard tent and mixed with a stereo board feed. The position of the tent on this day was very close to an outdoor bar, so there is some extra crowd noise not present on the other dates. With that caveat, Enjoy! As John noted several years ago, Lucero is the quality of band that impresses you the very first time you can a chance to see them live. For John, that was in early 2009 (here) and again for a secret show at Mercury Lounge last Summer (here). So as far as the nyctaper staff goes, I was the newbie to Lucero. But John was right. Within the first song of their set on Saturday’s Hotel Vegan outdoor stage, I knew that this was a band for me. They are no-nonsense honest alt-country and boogie outfit from Memphis whose live performances are exercises in full commitment. Lead singer Ben Nichols noted that he was exhausted for this afternoon show on the final day of SXSW, but that was good because it meant he was “doing his job”. At Hotel Vegan, the Saturday outdoor show was a wealth of music riches, with outstanding bands before and after Lucero — but their set was certainly a highlight. Currently on tour in support of the new album Women & Work, Lucero’s set contained a few of the new numbers but also a nice selection of older songs. We’re streaming “Sixes and Sevens”, the show’s climax before a quiet number closed the set. Lucero will return to NYC for a show at Webster Hall on April 20, 2012. I recorded this set in a similar manner to the previous Hotel Vegan set (Fanfarlo), by mixing the Sennheiser MKH-8040s with a board feed. For this particular set, the “noisy neighbors” did not have their system cranked, and our location was more centered. The result is a superb recording. Enjoy! If you download this recording, we expect that you will PLEASE SUPPORT Lucero, visit their website, and purchase their official releases and merchandise [HERE]. NYCTaper went on the road to Austin last week for the annual SXSW Festival. As I tweeted at one point near the end of my trip, SXSW is kind of like CMJ on steroids. There are a ton of corporate-backed “scene” shows downtown that really don’t appeal to me. However, on the East side there was a series of unofficial showcases that featured just about every band you could see downtown, only under much better circumstances — a relaxed atmosphere not overrun by commercialization. That’s where we spent the Fest. The best of these unofficial shows was the four-day afternoon showcases presented by brooklynvegan at the venue Hotel Vegas, rechristened “Hotel Vegan” for the week. Each afternoon eight or nine band played on an outside stage while inside there was additional bands on two other stages. We camped out on Thursday at noon at the outside stage and that’s where we stayed for the next three days. Each day’s afternoon showcases were recorded, and I’ll be featuring a large amount of those recordings over the next few weeks. One of the highlights of Thursday’s show was the set by the British-based band Fanfarlo. They are currently in the US on tour to support their new album Rooms Filled With Light and based upon reviews, I expected the Fanfarlo to have a more pronounced electronic feel to their beautiful indie-folk. I had not seen the band since 2009 (here) and while its clear that their sound has changed, I find it more of an evolution than a departure. The focus remains on Simon Balthazar’s vocals and songwriting accompanied by a variety of instrumentations from the talented band. At this Hotel Vegan show, it was the horn playing that cut through the heat, chatter and outdoor sounds to propel the band forward. The set consisted of all but one song from Rooms, and we are streaming “Deconstruction”, a powerful song that builds in intensity to a stunning conclusion. I recorded all of the Hotel Vegan outdoor sets with the assistance of my new Sennheiser MKH-8040 Cardioid microphones and they certainly proved up to the task. 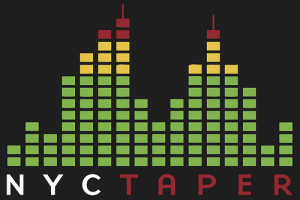 These recordings presented many challenges, the most pronounced of which was the persistent thumping of bass and drums from an adjacent competing stage (unaffiliated with brooklynvegan). Our “neighbors” seemed to feel the need to compensate for the poor attendance at their show by cranking their sound system. Some of this noise can be heard in between songs in many of the Hotel Vegan recordings. There was also the expected constant chatter and movement of the Festival crowd. I was also assisted with an excellent soundboard feed by the superb FOH technicians Toby and Taylor employed at the Festival by Miller Pro Audio. With all of these challenges (and caveats), I still feel that the sound quality of these recordings is excellent under the circumstances. Enjoy! If you download this recording from NYCTaper we expect that you will PLEASE SUPPORT Fanfarlo, visit their website, and purchase Rooms Filled With Light directly from the Fanfarlo webstore [HERE]. On Saturday December 9, 2011, PS Eliot played its “final” show at Death By Audio in Brooklyn in front of less than 100 people. A lot has changed in the subsequent five years not the least of which is the enormous success enjoyed by the two sisters who anchored the original band. Katie Crutchfield’s Waxahatchee has released three well-received albums and is currently signed to Merge Records, and Allison Crutchfield’s band Swearin’ has also released two excellent albums and Allison recently signed as a solo artist also with Merge. Although the band played a brief one-off reunion at Silent Barn in 2013, this year became the right time to look back and do the full-on reunion. Earlier this year Don Giovanni Records released 2007-2011, a thorough compilation of the band’s original discography, which also includes bonus home demos and a complete oral history of the band in zine format that was assembled by the writer Liz Pelly. The release of the complete discography has also fortunately been accompanied by a band reunion and a mini-tour. The Crutchfield sisters joined again with bassist Katherine Simonetti and guitarist Will Granger to play a six-date tour that included stops in San Francisco and Chicago and completed with a headlining spot at Don Giovanni’s New Alternative Music Festival this past Friday and two final dates at Philadelphia’s MOCA last night and tonight. The fourth date of the tour was at our own Market Hotel on Thursday when the band played in front of more than 500 people. From the very outset PS Eliot and crowd were fully engaged in the experience. Throughout the night, the Crutchfield sisters were out and about at the Market and there were a lot of excited greetings and hugs for old friends. When the set began it was clear that the quartet were fully in sync and for the hour-long set they passed around a bottle of pink champagne while they worked through a large assortment of classic PS Eliot material. The band was tight, energetic and seemed to be having a great time. If playing PS Eliot material is this much fun for the group, I would venture a prediction that this is not the last we will see of them. And that would be great news. I recorded this set with the installed AT mics mixed with House FOH Jason Kelly’s superb feed. The sound quality is outstanding. Enjoy! The Smith Westerns were certainly the youngest band that played the Showpaper/ToddP/Pitchfork benefit at Market Hotel two weeks back. The band is still somewhat raw, but the talent is clearly evident in their infectious garage-pop via Chicago. While the teenage behavior problems have gathered some recent blog attention, the music of The Smith Westerns at the Market was the real story — melodic lead guitar, hard chords, and vocal harmonies that mix both the late-60s pop and early 80’s post-punk. This recording was captured the same as the other sets from this night. The sound quality is rough by genuine. Enjoy! If you email nyctaper for access to this recording, we expect that you will PLEASE SUPPORT Smith Westerns, visit their MySpace page, and purchase their debut album from Hozac Records [here]. The Showpaper benefit at Market Hotel, produced by ToddP and curated by Ryan Schreiber of Pitchfork, was a marathon musical event but was infinitely worth the time and effort. 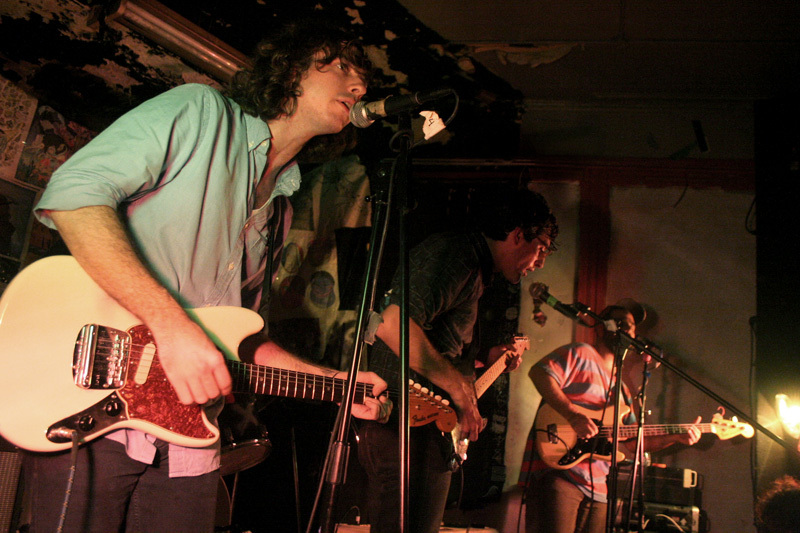 One of the true revelations of the night, and indeed all of CMJ, was the performance by Real Estate. I had seen the band last summer opening for Love Is All at Music Hall, which was an unmemorable performance where the band suffered through some technical problems. On Saturday, Real Estate was in its element and brought a substantial fan base to the event. The band’s mix of freak folk-rock and psychedelia is rich in guitar band influences and punk ethos, but the most compelling element was the authenticity and the fun-without-self-consciousness in the performance. After a week of seeing far too many bands striking a pose, I welcomed the sounds of a band that seemed to like each other, like themselves, and like the music they were playing. We recorded this set with the four-track recorder and captured a stereo feed from the board mixed with two Neumann mics in the room. As has been reported elsewhere, there were some significant issues with the sound system during the evening, but fortunately not during this set. The sound quality on this recording is quite clear but somewhat “raw” and unbalanced. With that caveat, enjoy! If you email nyctaper for access to this recording, we expect that you will PLEASE SUPPORT Real Estate, visit their MySpace page, and purchase their releases from Woodist Records (currently sold out, new release on November 17), Half Machine Records, and Underwater Peoples (currently sold out). When Oneida took the stage on Sunday morning at 2 a.m., a substantial percentage of the packed crowd at Market Hotel had already called it a night. The night’s festivities began at 9:30 p.m. and continued through a frenetic array of music, lights, and crowd buzz for nearly five hours before the headliners appeared. The core group of diehards were rewarded, as Oneida delivered a blistering and unwavering set of 75 minutes of their unique powerful neo-psychedelic punk. The highlights included the 14-minute trance-like version of “Snow Machine”, and the set-ending “Double Lock Your Mind” where Bobby and Kid traded several minutes of pounding crescendo beats and closed the set at nearly 3:30 a.m. The Market Hotel presents a compelling and interesting new approach to live music. While the location is actually a home and developmental space for 8 artists, on weekends it becomes a private party of music managed by the ubiquitous Brooklyn promoter ToddP. While an early event caused a minor legal problem, it appears that the artists and the promoter have ironed out the system and have created a space with a buzz, a great vibe, and some terrific energetic young bands. We saw absolutely no violations of the kind which brought about the legal issues, as attendees appeared to be respecting the space and the rules. There are two unfortunate aspects of the venue that need to be reassessed. Since the concerts are technically part of a private party, the space permits smoking but does not provide much ventilation. A vast number of people took advantage and chain-smoked throughout the night. The result was an aesthetically unpleasant cloud of cigarette smoke, which was unfortunately a health risk for asthmatics like us. Frankly, we are not going to be able to return to this venue after the breathing problems we encountered as a result. We would hope that the venue would create a smoke free environment, or limit smoking to the outer rooms. The other problem for the Market is its rather primitive sound system. There were a ton of technical problems throughout the night, particularly with saturation and distortion in vocal microphones. The hard-working sound tech solved most of the problems, but you can hear some of that vocal distortion in this recording. Fortunately, we were able to set up at an excellent location in front of the stacks, and capture an excellent recording albeit within the limitations of the system — some minor distortion, buzz, and feedback are evident throughout. Enjoy! Thanks Oneida (via Bobby) for permission to record!